Billy Rolland Cowan was born on August 28, 1938 at Calhoun City, Mississippi. The six foot right hand hitter, attended the University of Utah and was signed by the Chicago Cubs in 1961. He was the 1963 Pacific Coast League MVP hitting .315 with 25 HRs & 120 RBIs at AAA Salt Lake City. Cowan made it to the big leagues the next season. He had his best season in that rookie year, hitting 19 HRs with 50 RBIs, 16 doubles & 12 stolen bases (9th in the league) batting .241. He struck out 128 times (second in the NL) while posting a poor .268 on base %. In the outfield he made a league leading eleven errors with a .965 fielding %. In the off season he was traded to the New York Mets in exchange for George Altman. 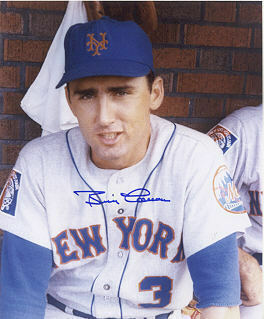 He was the Mets leadoff hitter & centerfielder on Opening Day 1965, going 0-4. Cowan wasn't hitting barely keeping his average above .200 most of the season. On June 21st he hit his first HR of the season. It was the only run scored in the game, as Al Jackson beat Claude O'steen with a three hit shut out at Dodger Stadium. At the end of June he hit HRs in back to back games at Shea Stadium in games against the Milwaukee Braves. That week he also had a five game hit streak. But after 82 games he was only hitting .179 with three HRs a .205 on base % & nine RBIs and was traded to the Milwaukee Braves for two players to be named later (Ernie Bowman & Lou Klimchock). Trivia: He was the last Mets player in the sixties to wear the uniform #3 as Bud Harrelson took it over in August 65 when Cowan was traded. Harrelson would wear the number until 1977. He spent 1966 in the minors, getting traded to the Chicago Cubs for Bobby Cox that same year. Cowan appeared briefly with the Philadelphia Phillies (1967) & the AL NY club (1969). That year at the end of July he was sent to the California Angels and hit .304 there the rest of the way in 28 games. He would spend four years with the Angels averaging batting .276 in both the 1970 & 1971 seasons. He put up similar numbers each year hitting 5 HRs with 25 RBIs in 68 games in 1970 & then 4 HRs with 20 RBIs in 1971 in 74 games. 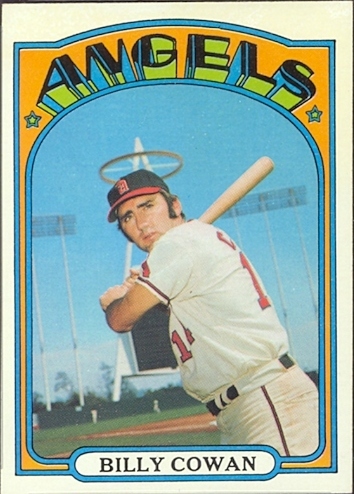 Trivia: He has a great 1972 Topps baseball card, with the Angels Stadium, Big A behind him and the large halo circling his head. In his eight year career Cowan batted.236 with 281 hits 40 HRs 44 doubles 8 triples a .269 on base & 125 RBIs. He struck out 297 times 1190 at bats.